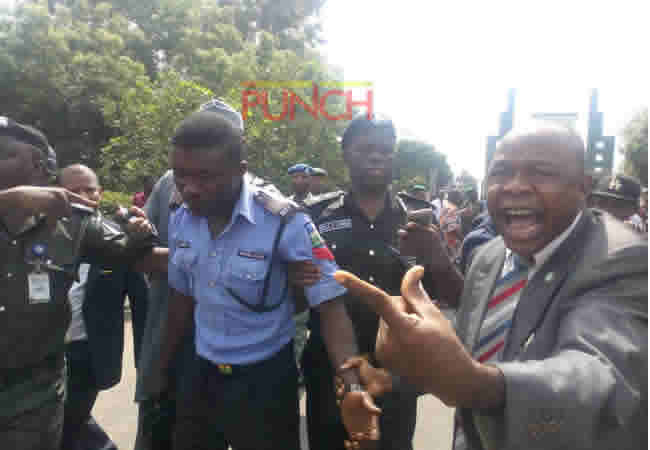 A female student of Moshood Abiola Polytechnic, Abeokuta, Ogun State, collapsed, while a policeman was injured on Monday as scores of students of the higher institution took to the streets to protest their inability to sit for their second semester examination since September 18. The students who launched what they tagged ‘black week,’ said the protest was mainly due to inability of the students to commence second semester examination, which was earlier scheduled to commence on September. It will be recalled that the Academic Staff Union of Polytechnics, MAPOLY chapter, had postponed indefinitely the second semester examination scheduled for September 18, based on the state government’s creation of Moshood Abiola University of Science and Technology out of MAPOLY. The state government also created the Ogun State Polytechnic, Ipokia. The students who wore black T-shirts commenced their protest march at Pansheke, a major terminus to their school, and moved through Oke Ilewo-Kuto-NNPC junction and terminated it at the governor’s office at Oke Mosan, chanting solidarity songs. Traffic and vehicular activities along these routes were disrupted for many hours. Some of the students were seen armed with placards with different inscriptions, such as “Bring back our exam,” and “MAPOLY must survive,” among others. The students said their second semester examination had been slated twice but on the two occasions, it was postponed. They claimed they had been at home for three months without government doing anything about their plight. The Higher National Diploma students in their final semester lamented that they ought to have joined others who have already been mobilised for the one-year National Youth Service Corps, but they had yet to sit for their second semester examination. The students, however, met a detachment of policemen around NNPC junction, which led to a confrontation, as the students were said to have obstructed the vehicle of the policemen. The policemen allegedly fired teargas canisters at the students to disperse them, and a female student, said to be asthmatic, collapsed. She was said to have been rushed to the state General Hospital, Ijaiye, for medical attention. The students later marched to the governor’s office at Oke Mosan, demanding to see him. But the governor was not available. The Secretary to the State Government, Taiwo Adeoluwa; and Chief of Staff to the Governor, Tolu Odebiyi, came out instead, but the students refused to listen to them. They insisted it was Governor Ibikunle Amosun they wanted to see. The students got restless and started hurling stones at the policemen, during which one of the policemen, Samuel Daniel, got injured on the head, with the wound dripping blood. The protest was led by the coalition of the National Association of Nigerian Students, National Association of Polytechnic Students and the National Association of the Ogun State Students. The chairman, NANS, Ogun State axis, Olawale Balogun, said it was sad that the students had been at home for three months, with both the state government and the lecturers refusing to address the students’ plight. He said, “We will not stop this protest until the government heed our call. We are appealing to the two parties to resolve their differences. Meanwhile, the state government has expressed disappointment over what it called “uncivil conduct of the students,” noting they had “rebuffed” every attempt by the government’s delegation to address them.